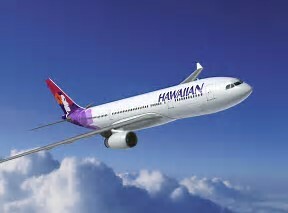 Hawaiian Airlines, has announced its system-wide traffic statistics for the month ended May 31, 2018. The Company also updated its expectations for certain second quarter financial metrics and its fuel costs for the full year 2018. Hawaiian welcomed more than 1 million guests in May 2018, a record for the month of May and an increase of 4.7% over the same period last year. Total traffic (revenue passenger miles) increased 5.6% on an increase of 6.5% in capacity (available seat miles). Load factor decreased by 0.8 points to 85.9%. The table below summarizes May and year-to-date traffic statistics compared to the respective prior-year periods. The Company has revised its expectations for the quarter ending June 30, 2018, provided in its First Quarter 2018 Earnings Release on April 24, 2018.
revised its expectations for economic fuel cost per gallon. The table below summarizes the Company's revised expectations for the quarter ending June 30, 2018, expressed as an expected percentage change compared to the results for the quarter ended June 30, 2017. See Table 1 for a reconciliation of GAAP operating expenses to operating expenses excluding aircraft fuel and special items. Excluded from the Company's expectations for CASM excluding aircraft fuel and special items are any assumptions related to the amendable contract with its flight attendant union. Fuel cost per gallon estimates are based on the June 8, 2018 fuel forward curve. See Table 2 for a reconciliation of GAAP fuel costs to economic fuel costs. The Company also revised its expectations for economic fuel cost per gallon for the full year ending December 31, 2018, also previously provided on April 24, 2018, as noted in the table below. The Company's expectations for the full year CASM excluding aircraft fuel and special items remain unchanged.